​Class 1 and Class 2 with high banks and impressive scenery reward paddlers early on this reach. Mile 4.5 - A short drop of Class 2 water (Class 1 in summer). Then the river is flat with an occasional Class 1 quick water. Mile 3.3 - Tomhannock Creek enters on river left. The river slows its course, flowing through open farm fields and winding between gravel bars. 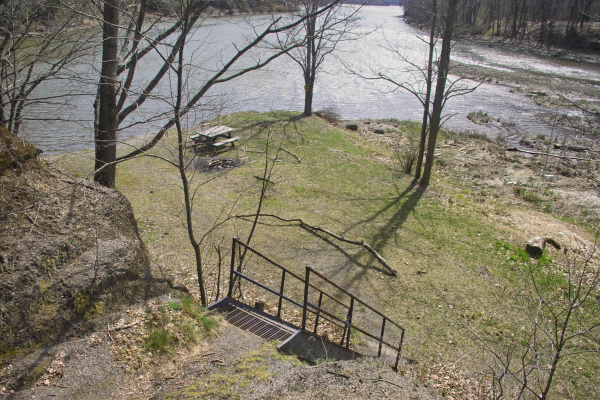 The Hoosic becomes wide and shallow here, and may be hard to navigate in low water. Mile 0.0 - The mouth of the river. 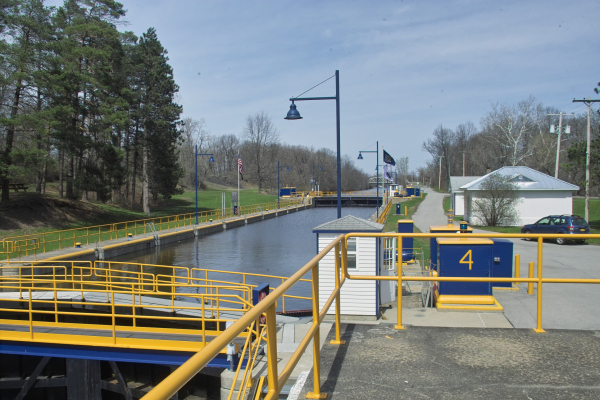 Pass a navigation light on your right then paddle the 0.3 miles towards the Champlain Canal’s Lock Four. Take out low lying grassy area opposite the parking area where there is a picnic table and stairway. If you arrive after 5:00 pm, there is some concern since there is no one maning the lock. The gate is closed and the walk out is very long. 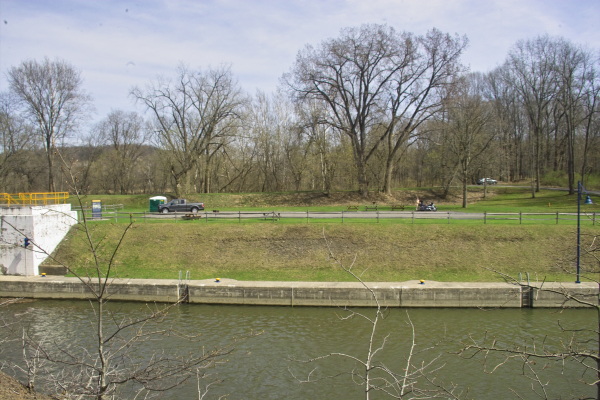 There is a parallel road that runs to a farm on the opposite side of the canal area. There is some debate whether this area is open to the public. It is state owned land. You will need to pass through a gate that says “Authorized Personnel Only”. About 200 yards down is a yellow gate. Park at the yellow gate and walk the short distance to the take-out. Paddle up to the opposite side of the lock where the land is low and there is a picnic table and stairway. From the intersection of Route 22 and Route 67 in NY State. There is a flashing yellow light and Bensons Family Restaurant is on the corner. Head west on Route 67 toward Eagle Bridge. At mile 0.8, cross the river on a metal bridge. Continue on Route 67 West. 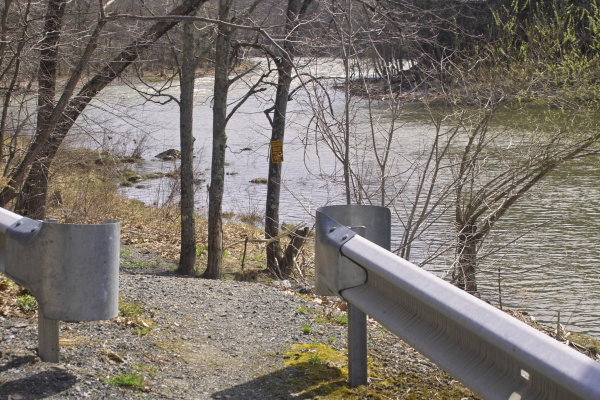 At mile 11.0, cross the Hoosic River in Valley Falls. Stay on Route 67 West. At mile 12.3, at the stop light, continue straight onto Stillwater Bridge Road, county Route 125. At mile 16.7, turn left onto Canal Road. This is just before the Stillwater Bridge crosses the Hudson River. At mile 17.2 arrive at Lock Four parking area on your right. Drive past the lock to this parking area. The best take-out is opposite the lock parking lot. Cross over via the lock gates or walking bridge. Then follow the trail to the stairway. Take the stairway to this low lying area. ​You will have to carry your boat up the stairway and over the lock bridge. Park at the designated area at the Power Station. Carry your boat to the water. At mile 12.3, turn left onto Main Street in Schaghticoke. Pass over the Hoosic River. At mile 13.4, turn right onto Chestnut Street. At mile 13.5, make a slight left onto Powerhouse Road. At mile 13.7, Powerhouse Road makes a sharp left. At mile 14.1, cross over river on a beautiful bridge. 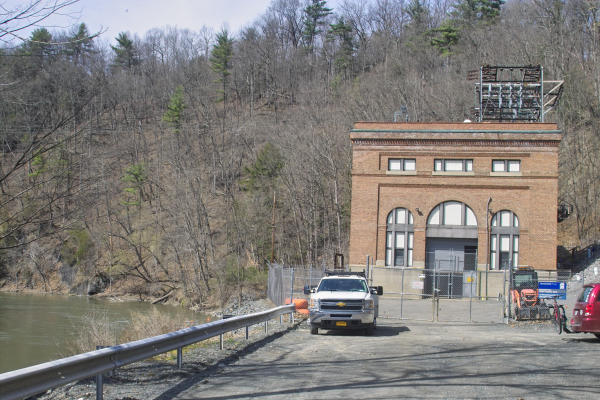 At mile 14.3, Arrive at the end of the road at the Brookfield Power substation. There is a sign for parking. It's limited parking, 3 to 4 vehicles. Above is the power station. The ride in can make you wonder if you are traveling correctly. Even if you are unsure on the gravel roads, cross the bridge and follow to the end at this station. Use the break in the guard rail 200 yards before the station as your launch site. There is a sign indicate daylight hours ownly.